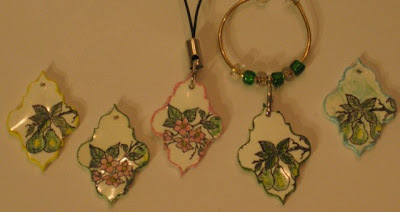 Firecracker Designs by Pamela is closing her doors- Pamela has posted new prices on her website- I recommend stopping by ASAP because at these prices, they will not last long at all! 75% off all rubber stamps, 25% off most accessories (prices already marked)!!! Last day of sales will be Dec. 15th. All NEW!!! Dude Time Doodles –COME HOP WITH US!!! It is official Dude Time Doodles and Bonibleaux Designs Digis FIRST monthly New Release Blog Hop! And, it’s the very first DTD Blog Hop ever- the Design Team is showing all of the new release digis all worked up for your viewing pleasure. I chose to play with the Pumpkin Field Digi. I colored the image with Copic markers, I used a plaid background suitable for any DuDe and I did a zig-zag stitch around the edge. 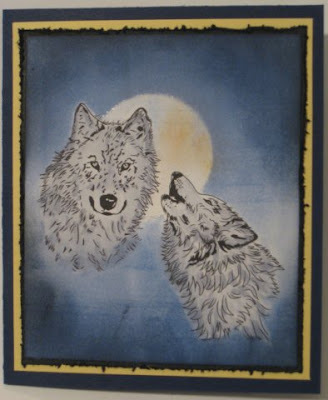 The background panels are a Technique Junkies technique called Instant Crackle and the orange ric-rac is Stippled Pigments. 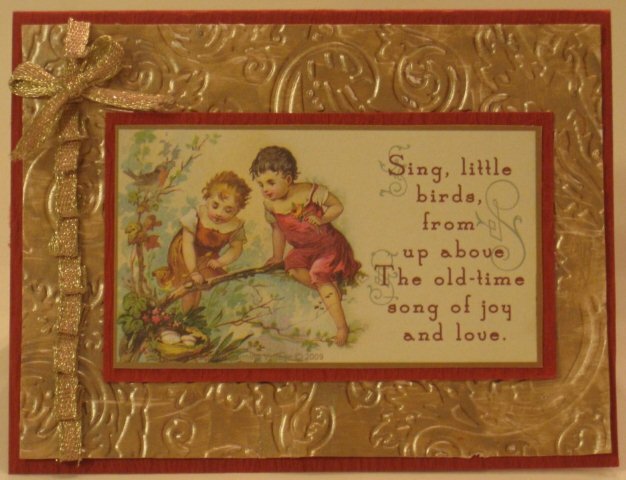 I added a sentiment and a few dew drops to balance out the card. Now on to the really cool info: For today only Dude Time Doodles is extending its two FREEBIES - BUT you've got to go "hunting" for them just like the Pilgrims went hunting for their Thanksgiving Day dinner! BUT that's not all, keep reading! Each Design Team Member will be giving away a New Release image during our Grand Opening!! So make sure that you leave a comment on each post during the Hop! You increase your chances to win both individual prizes and the Grand Prize. 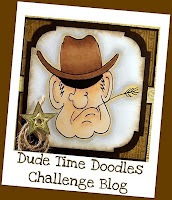 Winners will be announced on Dude Time Doodles on November 7, 2010. I am so happy to get to send you on to the Dude Time Doodles Blog next! We hope you like what you see! We certainly had a blast putting it together for you!! Happy Friday! 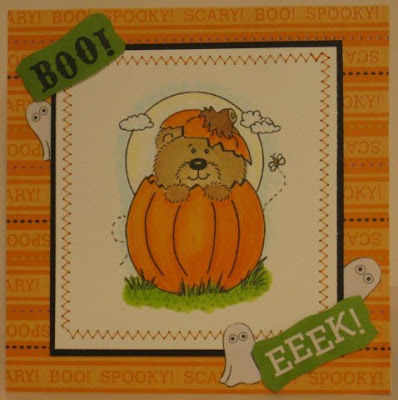 Our Bloggers Challenge ‘Mom’ Lisa challenged us to make a Halloween themed card. 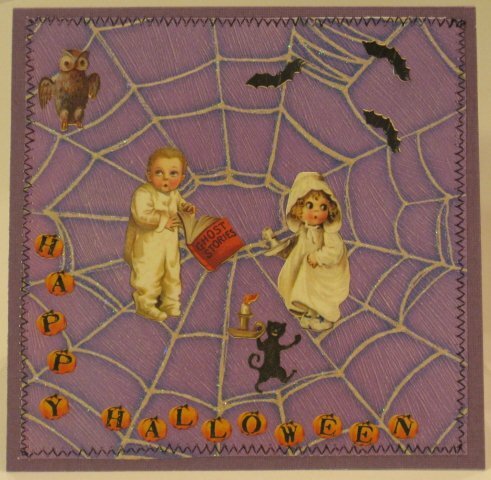 There is a challenge over at the Creative Inspirations Paint Blog- Nightmares- perfect card for that theme. You do not need their paint to enter the challenges and you will get an entry in the monthly challenge to win some CI paint! I cannot believe it has been a week since I last stamped! Tonight I tried an experiment to see if I could make my Creative Inspirations Paint background crackle- looks like it did a very teeny bit- but not what I was hoping for. I painted the white CS with Beige Creative Inspirations Paint. I ran it through the Cuttlebug using Regal Flourishes (Tim Holtz). 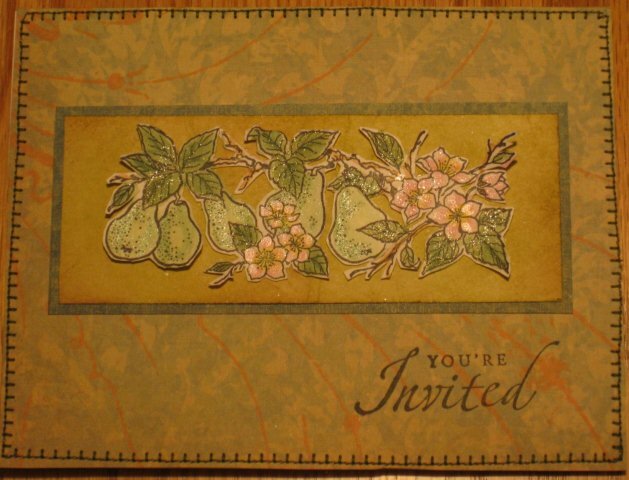 I found this sweet image by Crafty Secrets (Birds and Blossoms) and thought immediately of my Mother- I need to send her a card-perfect! 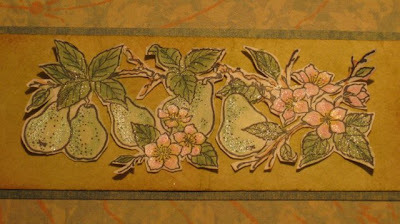 I added the Metallic weave ribbon (Martha Stewart) in Gold and Camelia Pink. I spent a few days at my parents home in No. Kentucky, then headed to OSU in Columbus to see my daughter- it was such a great visit. I stopped at Marco’s Paper on the way back home- delightful treat! Back to the real world now! 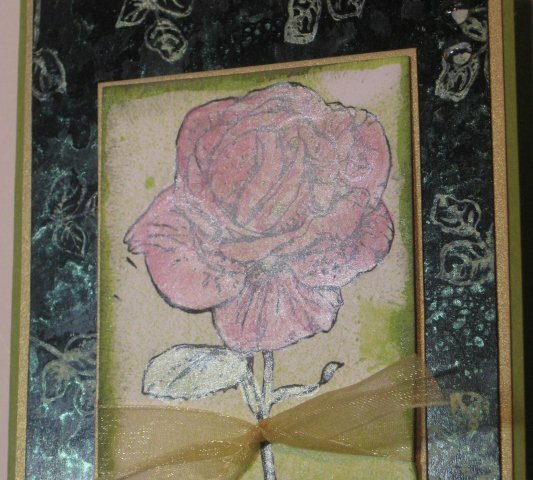 Please stop by the Creative Inspirations Paint Blog and see what the DT has been posting to inspire you! There is a weekly challenge you can join in and there is a monthly drawing to WIN CI Paints! (You do not have to use CI paints to enter). Here is a close-up- the shimmer is hiding the color blending- and I wanted you to see the color/shimmer on the BG- is it amazing IRL....! My mother is a Master Gardner and I am always drawn to floral images, and Pamela draws some gorgeous floral images! 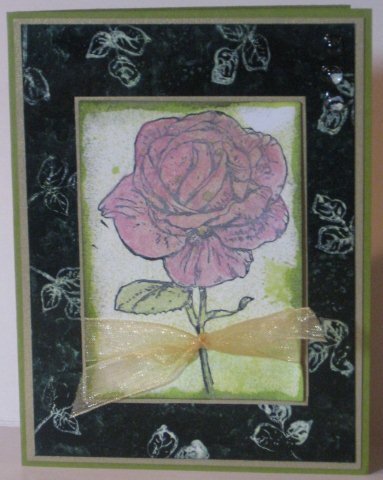 I used alot of special touches for your card Pamela- Glimmer Mist, Creative Inspirations Paint, and a nice gold bow. Pamela may your new ventures bring you pleasure and joy, and I hope to still keep in touch! 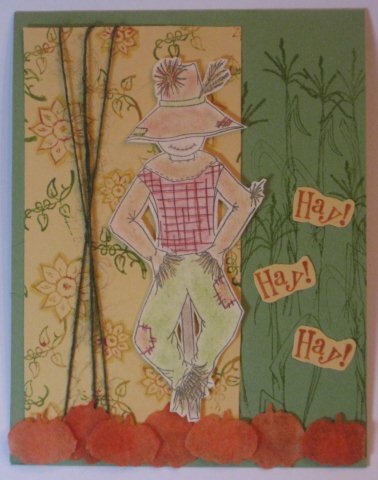 After you are done with the Blog Hop, Please stop by the Crafters Digital Art Center (CDAC)- where Pamela is hosting the Sketch Challenge this week- use the free digital image to create a card using the sketch and enter to WIN! 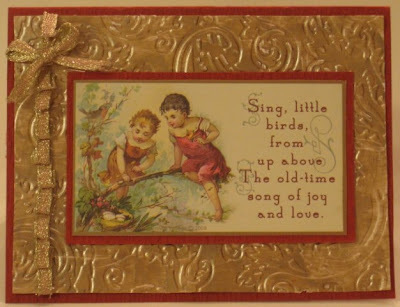 Thanks so much for stopping by- I hope you will stop by and say Farewell to Pamela at HER BLOG. and here is a close-up of the shimmer. I used a variety of Orange Copic markers- from YR000 to YR7. 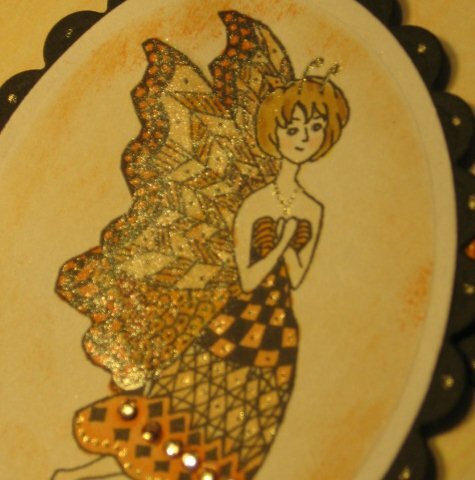 I used Creative Inspirations Paint in Peach paint to add shimmer on her wings and the ribbon and a Copic Spica pen to add highlights to her necklace and the scallops of the punches. 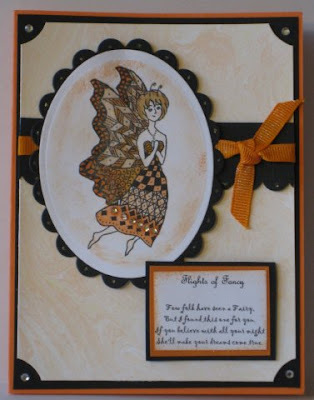 HERE is the link for the other players in the Bloggers challenge- stop by for some great creative B/W and Orange paper crafting ideas! 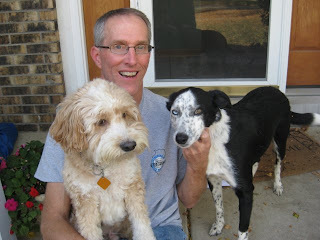 Before I really got to paper crafting, we were out in the front yard with our dog (cockapoo- Peanut). The neighbor’s dog Charlie came to say hello- and our jealous dog jumped right up on my husband’s lap- I had to snap a picture……. Hi- Happy Thursday! I am returning to the Creative Inspirations Paint team for the third time- another three months- I LOVE these paints, so am excited to play with them and show you what I create with them. The image is I Brake for Stamps. I colored the image with Copics and then highlighted with CI paints Sage, Evergreen, TuTu Pink and Canary. I know this die is available at trade shows from Our Daily Bread- because that is where I got it. First, I made a ruler (on the Lt ) out of shrink plastic- what began as 2 1/2 inches is now 1 inch- that is how much your project will shrink. 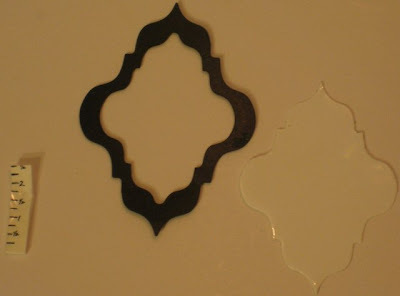 Stamp the image onto the shrink plastic with Stazon. 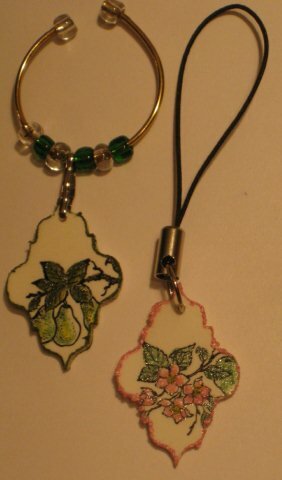 I colored the images strictly with CI paint, punched a hole at the top and then shrunk them with my heat gun. I used some CI paint to highlight the edge of the shrink plastic before I added the heat to give the edge some color- they are very sparkly IRL. I hope you will join in the Creative Inspirations Paint challenges- the Current Challenge is Little Things- you do not have to use CI paint for your entry. We would love to have you join us! Hope you enjoyed my post today- have a great day! 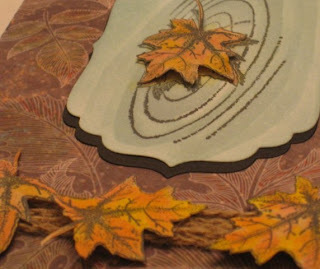 For more inspiration, the DT posts can be viewed on the Creative Belli Blog HERE. 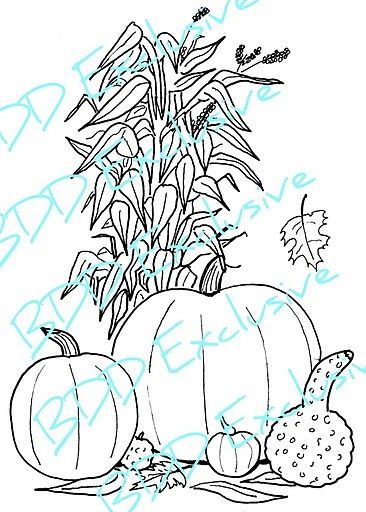 We would love to have you join us with your Pumpkin themed creation! The sentiment is by Firecracker Designs By Pamela- HERE is the link to check out this set- it is 50% off for the FCD going out of business sale going on now. I met Boni this year when she joined the FCD design team- she has turned her doodles into Digital Images and is currently selling them at FCD. When Pamela announced that the FCD store is closing, Boni decided to open her own web store with her images- along with a challenge blog-Dude Time Doodles. Stop by Dude Time Doodles for the DT call info PLUS take a look at Boni’s images. 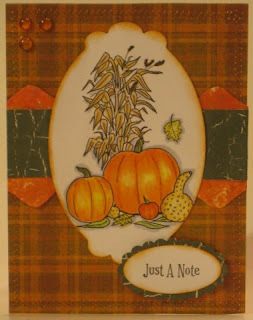 I had a fun time guest designing for the Technique Junkies Oct/Nov newsletter and made this card using a fun image Pumpkin Head made by Boni- currently available at FCD. I used the Marbled Smooch technique plus the Smooched Metal techniques from the Oct/Nov Technique Junkies newsletter. 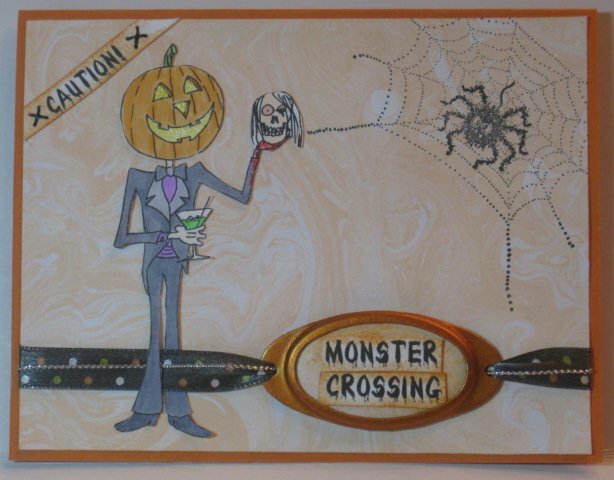 I used the ribbon attaching the metal tag and played off of the Monster Crossing sentiment-one leg over the ribbon like he is ‘crossing it’………. The image is colored with Copics with Creative Inspiration Paint to highlight the pumpkin ‘innerds…..’. 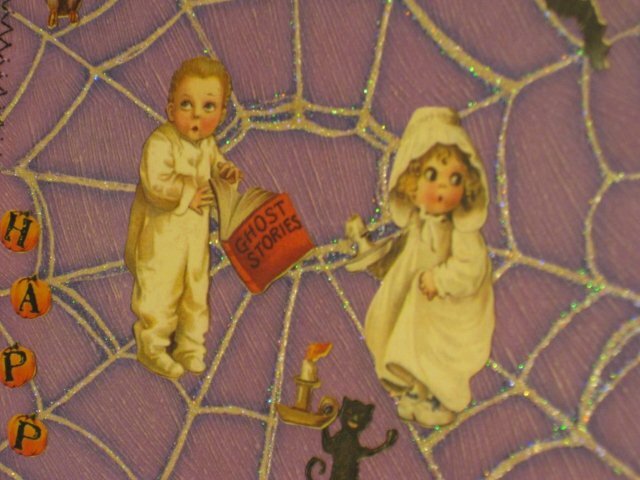 The spider web (Annette Allen Wookins) and spider (PSX) are rubber stamps from my stash. Stop by the Dude Time Doodles Blog and check out the DT call- and the images- the DT will be a four month term and will begin Oct 31st!!! PLUS, if you have a challenge Blog and want Boni to sponsor your challenge- let Boni know!!! Allsorts-Inspired by a Song- We did the Mash….we did the Monster Mash……. Digi Doodle Best Shops- Use some orange…..
For Fun-use something purchased and never used- metal finding is at least 8 yrs old! 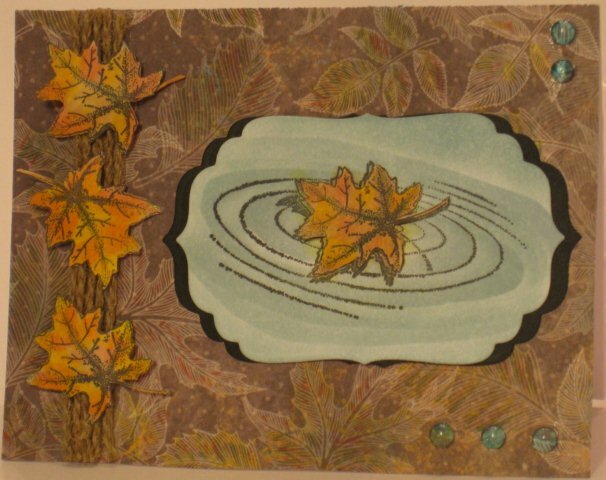 Our Blogger ‘Mom’ Lisa has challenged us to a Sketch Challenge this week. I am trying to use up my stash and found this SU DSP and this really old Embossing Arts stamp- that I just love. 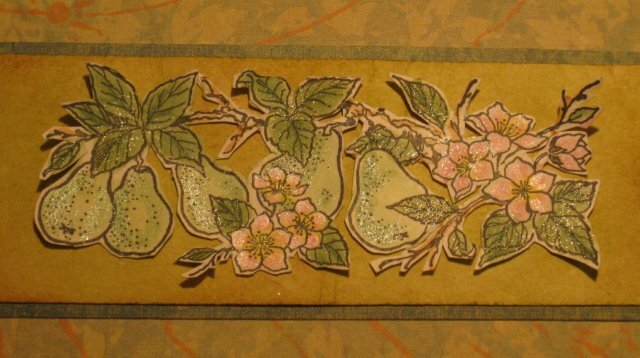 I recently saw that I Brake for Stamps will be carrying the Embossing Arts stamp line, and of course I had to drag out all of my stamps and see what I had from that line……. I used Copics to color the images and used the Paper Tole Technique from (June 2003) Technique Junkies- I love a challenge….! 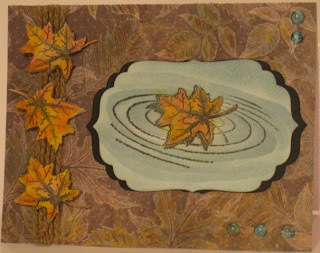 I stamped the image on a post-it note, and cut out layers of the ripples on the Nestability layer from the inside out. I sponged Soft Sky in varying degrees of color for the ripples. For the black layer, I cut out 1 1/2 of the Nestabilities and layered them a little overlapping. I added a little touch of color that I used on the leaves with the Copic markers to the DSP to liven it up a touch. 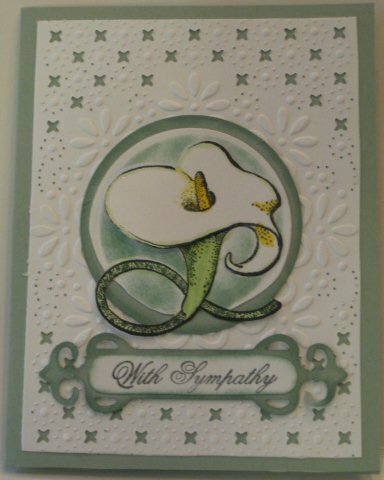 My husband thinks the colors are too dark- he rates this card a ‘5’…guess I will not be giving it to him! I hope you have a great day- Thanks for stopping by! Stamps R Us Challenge Blog has a Nature theme and the sponsor is Digi Doodle. I chose this gorgeous digi image of a set of wolves- WOW- doesn’t this just call for a Zindorfian type brayering experience??? On a digital image? Well- that’s another challenge……but it worked! I printed out my digital images on cardstock AND on copy paper. I cut out the copy paper images and put them on top of the cardstock images. I punched out a 1 3/4” circle from a Post-it note and placed it over the images as well. I simply held the copy paper masks over the Wolves (the post it moon helps the papers stay put because it has a touch of adhesive on it). For the brayering, first I used Blue Bliss, second Night of Navy and then added some Black in the four corners. I sponged a touch of the lightest blue and a smidge of So Saffron over the moon. I colored the Wolves with Copics C1, C3 and C5. I added a touch of W5 for the eyes. The main panel is backed with black cardstock-which is distressed, then So Saffron and then Night of Navy. Thanks for stopping by! I hope you can join us with your nature inspired card- you have two weeks to create! Ali Manning is a Technique Junkie and a co-owner of the Gingersnaps Challenge Blog. Today she is the Featured Stamper at SCS. I was inspired by about everything in her gallery, but when I saw this card- I knew immediately that would be my inspiration for the day! I made this card for my daughter- a celebration of sorts- she was named one of 6 semi-finalists for the National Merit Scholar- which is quite the honor for her. She works really hard at her studies, and we are really proud of her! Congrats Stephi- You Rock! 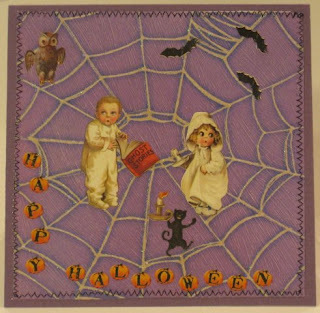 I had this set by My Favorite Things on my desk to make a card for Stephi, and when I saw the paper piecing (which I have only done once or twice in the past)……I was sold! I used up some SU DSP that I had been hoarding. I colored the image with Copics and added glitz with the Copic Spica Pens. 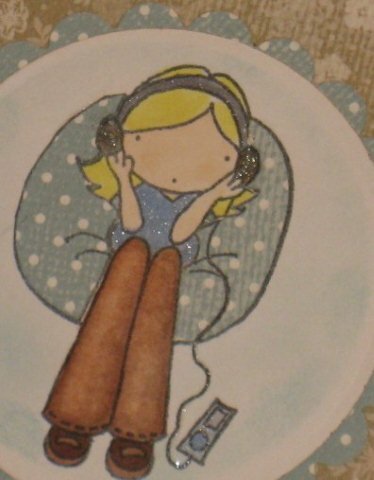 The sentiment is popped up on pop-dots and brads hold the label punch layer. This is a Technique from the Oct/Nov TJ newsletter- Pencil Highlights. Hay Hay Hay!